An RTD (Resistive Temperature Device) is made of metal such as Platinum (PT) or Nickle (Ni). 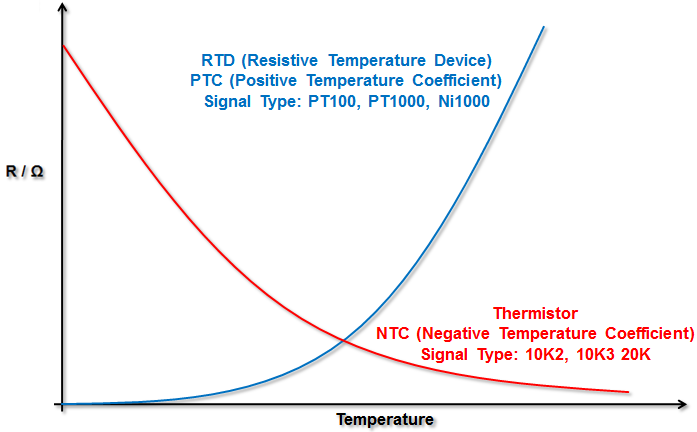 As temperature increases the resistance measured in ohms increases; this response is called PTC (Positive Temperature Coefficient). A Thermistor is typically made of ceramic or polymer material. In the HVAC industry, the resistive to temperature response is NTC (Negative Temperature Coefficient); as the temperature increases the resistance measured in ohms decreases. To view typical sensor resistance and temperature data click here.